Welcome to the Albuquerque Rose Society website. We are an eclectic assortment of rose aficionados from diverse backgrounds. We meet at the Albuquerque Garden Center and offer pruning demonstrations to the public at our Albuquerque Rose Garden each March with a Rose Show in May. We welcome all new members regardless of experience. 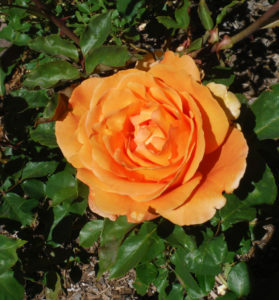 We maintain the Rose Garden (located at the Tony Hillerman Library) throughout the spring, summer and fall, planting new roses, deadheading and caring for established plants. Each spring, the Albuquerque Rose Society holds a judged Rose Show as well as participating in the State Fair Flower Shows. Our society offers our members numerous opportunities to meet socially, exchange rose care ideas and work actively to promote rose growing in Albuquerque. Join us! See our Facebook page for photos, events and discussions. Sponsors of the Albuquerque Rose Garden, Albuquerque's oldest public rose garden, established in 1962. The garden includes more than 1,200 roses that thrive in Albuquerque. Visitors may view the garden located at the Tony Hillerman Library: 8205 Apache Ave. NE 87110. A 501(c)(3) non-profit organization & affiliate of the American Rose Society. Copyright 2017.